Unbelievable as it is, I’m not quite through with Tangled. This second part of my saga is the alternate-title part of it, the part where I explain that (if you’ll recall) I saw the movie on borrowed time, and how both the movie and the time, along with some unexpected Christmas joy and a few strange and chaotic days of traveling gave a world of perspective to the addled state that was my mind in 2010. To start, the luminarias: in New Mexico, we have a tradition (perhaps my favorite of all traditions) of setting out luminarias on Christmas Eve. They’re little paper lanterns, made simply with brown paper lunch bags filled with sand and lit from the inside with a candle. They are spectacular. The whole city does it. Some houses, like ours, modestly line their lawns with a few dozen luminarias; other neighborhoods work together and go absolutely crazy with them, and the effect is breathtaking; an infinitely unfolding, softly glowing pathway of light as far as the eye can see. My dad usually takes the lead on the luminaria set-up at our house, but he had a hip-replacement surgery close to the holidays this year and was thus unable to take on any holiday responsibilities other than sitting on the couch and/or shuffling about in his walker and enthusiastically delegating to me and my sisters. So, the luminaria duties (among others) fell to me this year. Also to me: last minute Christmas Eve dinner shopping. So, on Christmas Eve morning I headed over to Smith’s to pick up the remaining items on our grocery list, stopping first at Walgreens on the way over for luminaria candles. But Walgreens, as it turns out, was out. No problem, I thought, they’ve probably got some at Smith’s anyway. Nope. Not only was Smith’s out of candles, but the entire store was a crowded mess. And not a crowded New York City mess either, where even in the worst areas the congestion is equal parts tourist and pissed off New Yorkers trying to get to work. No, nobody in that entire store seemed to know how to walk or stay out of everyone else’s way. I called home, and asked my sisters to go out and get some candles at the hardware store down the street, since it looked like I’d be at the store for a good long while. But when I got home, I found both my sisters plopped on the couch, in exactly the same place I’d left them. “Didn’t you get the candles?” I demanded. I left the house again for the hardware store. They were out of luminaria candles there too. And out at the nearby dollar store. And out at the farther-out-of-the-way hardware store. Finally, in the sixth store that I tried, I found some. We lit the candles before church and followed their glow across the driveway as we headed out toward the car. I noticed how ours touched against our neighbors’ on both sides, so that you could hardly tell where ours ended and theirs began. Oh, this, I thought. THIS is why the luminarias are so important to me. I can feel the whole community through these lovely, glowing lanterns. We’ve all done this together, lit these candles in the darkness. Together they make a bright path, lighting the way toward some kind of saving grace. They connect us in our hope to our neighbors, to the whole city, to the world. 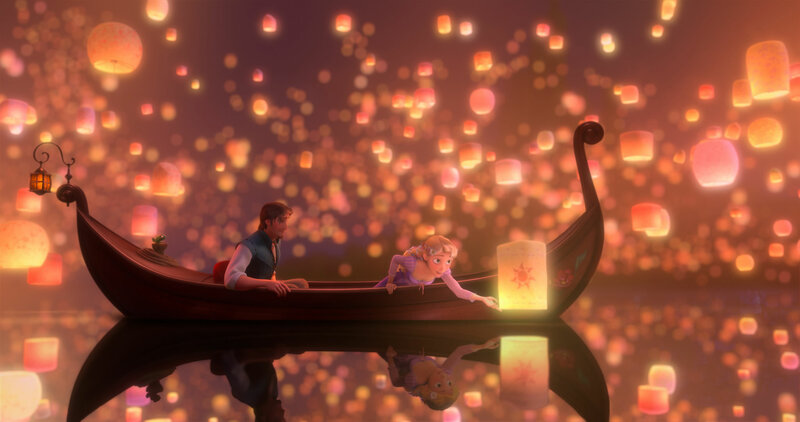 There's a beautiful scene in Tangled, in which Rapunzel watch the thousands of lanterns that are released by the kindom on her birthday in the hopes that she, the lost princess, might return. It's easily the most enchanting moment of the movie. I mean, look at it. It's only a short sequence, but before the lanterns are released, we see the King and Queen, her parents, look sadly at one another, still grieving after all these years, before launching their lanterns into the air, an act of reckless, unfounded hope. Their lanterns are joined by rest of the the kingdom's: a mass of tiny glowing testaments to their hope, a community united, their light persevering even in the darkness. Of course they reminded me of the luminarias. Not just in look, but also in the spirit of the action, the coming together to light the darkness in a shared expression of faith. For a long time I’ve been preoccupied with the overwhelming weight and mass of darkness in the world. It leaves me icily numb, unable to see a divine order, as much as I look for it. If you took all the darkness, all the evil in the world, I often think, and put it on a great big scale against all the lightness and good, the light may well triumph. But if it did, I think it might only be for coincidence. The awful unfairness of the world is a pretty obvious thing to be so hung up on, but there you have it. It is, and I am. But, say what you will, whatever light and beauty that does shine in this world, it’s true – the darkness does not overcome it. And maybe that’s enough. Maybe it’s more than I realized. The darkness does not overcome it. In entire the 72 hours after Christmas, nowhere I ended up was where I expected to be at any given point in time. I thought I would be detained several days due to the storm, but found myself booked the following day on a flight to Newark instead. When my Denver-to-Newark leg of the trip was cancelled, and I watched passengers frantically vie for seats on flights as far away as a week, I figured I was about to spend an unplanned week-long vacation with my Grandma in Colorado Springs. And when the customer service representative bizarrely, miraculous put me on a flight – the only flight – into LaGuardia that day, never did I expect to make it all the way back to New York only to get stranded in Queens. But I did. It was truly an exercise in patience, but I tried to be calm and accepting of every evolving circumstance. I’ve had a lucky streak of eventless flights in the past year or two, and this kind of thing is bound to catch up with you eventually. And who are you going to be mad at here, anyway? Weather is weather. But when I finally did end up stuck in deep Queens on Tuesday, LIRR-less and unable to get to work, I was disgruntled and overcome with guilt. I would have been okay with staying Colorado Springs with my grandmother for a week, in fact (much as I DID need the money this week) I was a little disappointed to NOT see her and all my aunts and uncles and cousins after all. And I took a seat on that miracle flight into LaGuardia from somebody who really needed it. And! After all that I couldn’t get to work the next day ANYWAY. I’ll spare the details, because they’re unimportant, but as it turns out, I needed that unexpected snow day in Queens more than I ever could have guessed. I spent the day re-defining a relationship with someone from whom I had parted on sad, ambiguous terms and without that time together, I would have been lost. I still think spending an extra week in Colorado would have been wonderful, but it occurs to me now that perhaps anything that might have happened would have been wonderful. It occurs to me now that I needed that entire travel fiasco more than I ever could have guessed. I needed the space to discover opportunities and possibilities in the midst of total chaos, uncertainty, and inconvenience. On the 26th of December, the day of the blizzard and my original flight, I woke up early with a lump in my stomach as I gathered my suitcase, headed for the airport, and contemplated saying goodbye to my family. Instead I enjoyed an extra day of rest, a fantastic movie with my sisters, and an unexpected feeling of peace. I am regular follower of your blog. I really like the way you describe each and every small thing. In this post also he explain the feeling of joy and togetherness. I also spend my Christmas with my family and friends. Thanks for sharing your thoughts with us.